Theresa's Mixed Nuts: NuNaturals NuStevia Review & Giveaway! NuNaturals NuStevia Review & Giveaway! When I was diagnosed with ulcerative colitis, I had to do a complete overhaul on my eating habits. Many foods that used to be fine no longer were. Refined sugar is one thing that my body can’t handle too much of. If you read this blog regularly, you know that I have a huge sweet tooth, and I like to share my sweet recipes. I like to bake them, but I can’t eat them. This was really hard for me to work around. I have tried artificial sweeteners, and I have never enjoyed any of them. When NuNaturals gave me the opportunity to review some sugar free products, I was excited by the chance of adding a little sweetness back into my life, but still a little skeptical that the products would taste better than the other sugar free sweeteners I have tried in the past. I was generously sent an array of their Stevia products to test out. Stevia is a natural sweetener, found in the stevia rebaudiana plant. It is 30 times sweeter than sugar, has no calories, carbs, and is low on the glycemic index, making it a perfect sweetener for diabetics, or those who just want to eliminate sugar from their diet. One of the things I miss most is sitting down with a cup of hot sweet tea in the mornings, so I brewed myself a cup of tea and added 1 packet of NuStevia white stevia powder. It was quick to dissolve and gave my tea the perfect amount of sweetness. My husband has started using it in his coffee in the mornings too. I have also been known to sprinkle some over my toast. Neither of us has noticed any bitter aftertaste. I actually still think my lips taste really sweet long after I have finished my beverage! The quick dissolving tabs are great too, though they do take a little longer to dissolve than the powder and the liquid. The alcohol free liquid stevia has also been wonderful to use in our beverages. Since it is very concentrated, a little goes a long way! The dropper makes it easy to measure out exactly how much I use. I normally put in about 15 drops into my tea. My husband uses just a few drops less for his coffee. The NuStevia Prebiotic Blend has quickly become one of my favorite products. As I mentioned, I suffer from ulcerative colitis, and digestive health is a top concern of mine. The Prebiotic Blend helps feed good bacteria to the system. I was encouraged to eat yogurt by my gastroenterologist because of the healthy bacteria it contains. The prebiotic blend also promotes the growth of the healthy bacteria in the digestive system, the same way the yogurt does. With NuStevia Prebiotic Blend, I just sprinkle a little over my food and in my beverages and get the healthy benefits my digestive system so desperately needs! The Presweet Tagatose is a natural sweetener found in milk, fruits and vegetables. It is 92% as sweet as sugar. This product is great for those who are trying to love weight because it is low calorie (6 calories per serving). It is also great for diabetics because it will not raise blood sugar levels. I did attempt to make sugar cookies with the Presweet Tagatose and they didn’t bake up quite right, and my kids weren’t too fond of how they tasted. However, I am going to try a different cookie recipe (oatmeal raisin) soon, and will report back if I am successful. My favorite NuStevia product has been the Vanilla Stevia! I first tasted it on my finger and was wowed at how yummy it is! I have been putting it in everything- my oatmeal, tea, my kids yogurt. My husband loves those flavored vanilla coffee creamers. They are so high in fat and calories, he only allows himself to indulge in them occasionally. He has been loving the vanilla stevia so much, he uses it daily to add a burst of flavor to his coffee! Not only does it taste good, it is fat and calorie free! Now he can indulge in a flavor he loves daily instead of just occasionally. The night before serving, mix 1 cup milk, oats and vanilla stevia together in a bowl. Cover and refrigerate until the morning. When ready to eat, pour the oat mixture into a blender. Add the blueberries and remaining 1/2 cup of milk. This makes enough for 2. We have really been enjoying playing around with the 4 liquid stevia flavors. They come in orange, lemon, peppermint and chocolate. Of course, my kids LOVE the chocolate flavor and have been making up their own little edible concoctions. I can think of a ton of uses for the peppermint for Christmas baking. The orange was a little strong right out of the bottle, but once I added it to my tea, it was really toned down. I did not like the lemon flavor. However, I have never been a fan of anything lemony tasting, so if you do, you will probably enjoy the lemon flavor much more than I did. I am extremely pleased with my experience with NuStevia products, and I plan on keeping them as a staple in my everyday cooking! 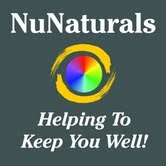 Right now NuNaturals is offering a 15% Discount on your ENTIRE ORDER when you use code BLG0613 at checkout. The discount is good until 6/30/13! Also, online customers will receive Free Shipping on all orders $35 and up, after discounts have been applied. NuNaturals is generously offering 4 Theresa’s Mixed Nuts Readers the opportunity to win 4 bottles of NuNaturals Liquid Stevia in orange, lemon, peppermint and the new chocolate flavors! The giveaway is open to residents WORLDWIDE, 18+! No PO Boxes will be accepted. The giveaway will run through 4/7. Winners will have 48 hours to respond to winning email or a new winner will be selected. Please enter on the Rafflecopter form below. *Disclaimer- I received the above stated products for the purpose of this review. No other compensation was provided. All opinions are my own and may differ from yours. Ahh, the smoothie looks absolutely delicious! Plus it's so easy to make and nutritional, so it makes the perfect breakfast for busy people. 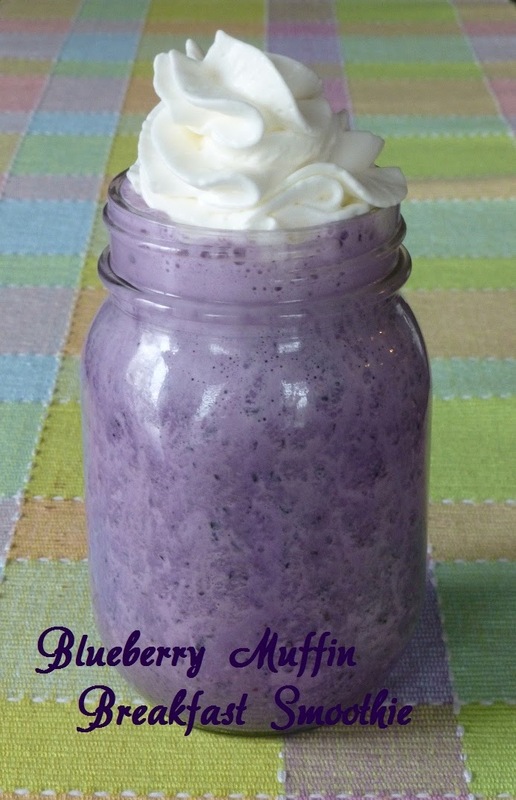 The blueberry breakfast smoothie looks awesome! I hope you had a good weekend! Can't say I like food you can't chew but it sure sounds like it is helpful at your zoo. OMG, what's that purple thing? 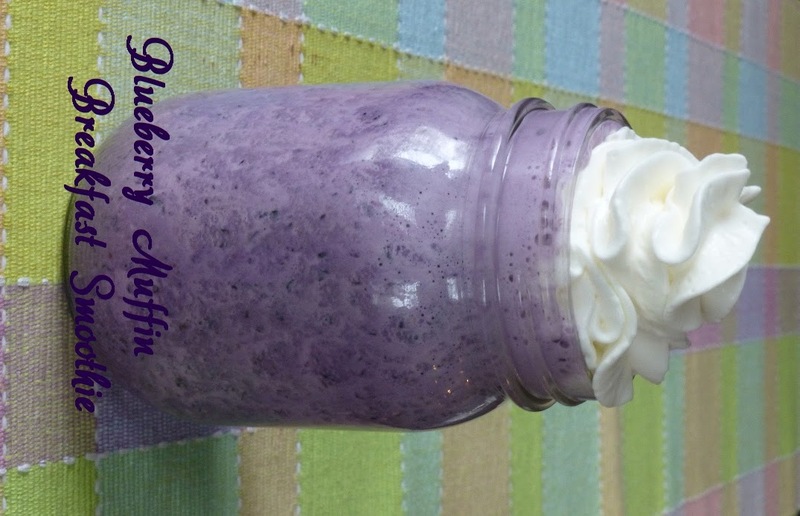 The Blueberry Muffin Breakfast Smoothie. I got make me some of that. Ooh, this sounds delightful, Stevia as a plant is REALLY sweet, so I would love to try the drops - hmmm, which drops, I am a peppermint junkie, but orange and lemon sound great and chocolate - oh my! - No I think I would go with peppermint. Thanks for this awesome opporutnity. That Smoothie looks beyond delicious (and I love the tablecloth, the colors remind me of Easter!). These sounds great! What an awesome way to add some sweetness as an alternative to sugar. That smoothie looks SOOOO yummy!! MMMMM! Yes, stevia is a good alternative to replace sugar. What? A BLUEBERRY MUFFING SMOOTHIE? OMyGosh! I have to do that!!!! haven't heard of this but would love the try the chocolate! They certainly do rock! Not only do they taste good, I love they are packed with antioxidants! thanks for the inspiration...i have everything i need to make these!!!! I am hosting tomorrow (the link is up) at http://www.frugalfitfamily.com! Swing by if you can! Forgot to say - I want to try the chocolate flavor. Oh for sure the Chocolate! Hiya gorgeous! That looks so yummy :) Visiting and following you from the hop! Follow back would be lovely. Cheers! I think lemon would be fun to experiment with!